Some of the findings from our recent research studies are posted below. The results have been summarized and are intended to provide the general public with some basic information about our research interests and how well-being, stress and health are related. More comprehensive and detailed results can be found in the published articles listed under publications and in the conference posters produced by PSYCH 492 classes. â€‹One's feelings of negative affect, life satisfaction, self-acceptance and autonomy on a given day are influenced by the previous day’s levels and experiences. However, personality can moderate this effect – people who score highly on agreeableness are quicker to recover from negative affect than others. Figure 1. 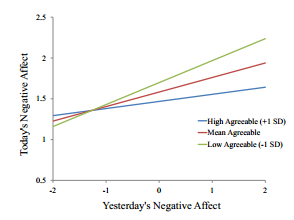 Agreeableness moderates the effect of yesterday’s negative affect on today’s negative affect. That is, people who score highly on agreeableness are less likely to have two days in a row with a poor mood than individuals who have lower agreeableness. Figure 2. Results showed that participants who reported high stress severity scored highly on cognitive interference and negative affect (poor mood). â€‹Figure 3. 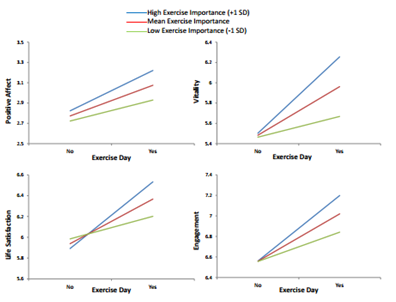 Our results showed that individuals who had exercised on a given day scored higher on several aspects of well-being (including positive affect, vitality, life satisfaction and engagement) than people who had not exercised that day. Figure 4. With higher reported stressor severity (left), participants’ reaction times on the Multi-Source Interference Task were higher, indicating that high perceived stress competes for cognitive resources. Participants who reported more stressors (right) also had higher reaction times on the Multi-Source Interference Task than participants who reported fewer stressors. This is also an indication that feeling stressed can negatively impact cognitive performance. Research with University of Victoria undergraduate students showed that quality of sleep and use of social support were significant predictors of the number of stressors reported, stress severity and perceived stress. Results from this study inform us as to how stress can be better managed over time. Use of social support networks and quality sleep habits seem to provide individuals with a buffer against the negative effects of stress on affect and cognitive performance over time. â€‹Figure 5. Participants who reported using a social support network were more likely to report more stressors (left) and higher stress severity (right) than people who did not use a social support network. This indicates that people use social support as a coping mechanism against high perceived stress. However, the high degree of variation in these ratings indicate that social support use is not the only factor that influences the effects of stress. Figure 6. Relationship between Multi-Source Interference Task reaction times and normalized gait velocity (a), step length (b) and step width (c). Faster, longer and wider walks were associated with better dual-tasking cognitive performance, suggesting gait may act as a protective buffer against the cognitive changes associated with higher age. Copyright © 2019, iLifespan. Theme by Devsaran.